This document goes through various features of the Nextion Editor. 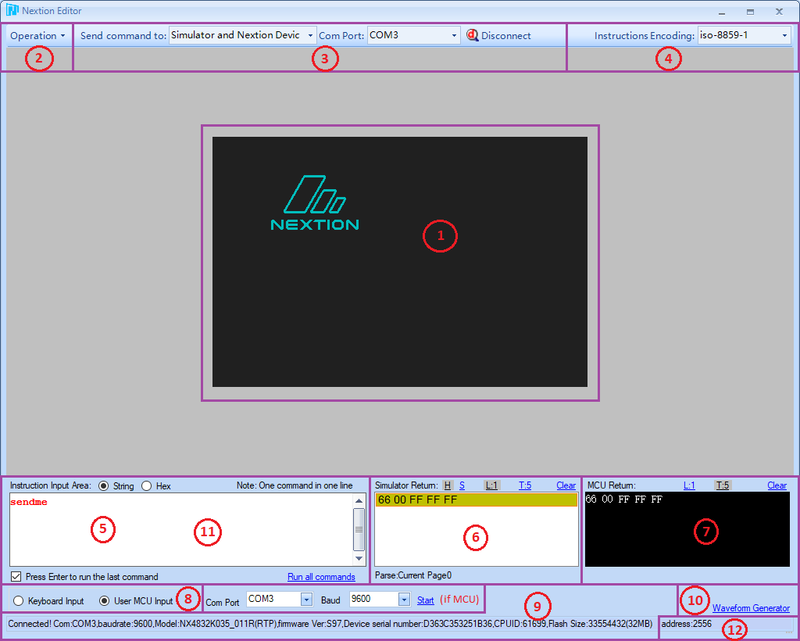 The Nextion Editor is used to rapidly create Human Machine Interface GUIs for Nextion HMI devices. As such the GUI can be created within Hours instead of Weeks, and Days instead of Months. So while we wont be covering basics such as opening a file, we will point out somethings that might prove helpful to know, or reminders need be made. Windows Operating System (XP or higher). Users must know and be able to use their Windows OS. Windows support is beyond the scope of Nextion. .NET 3.5 Assemblies installed. When needed, download and install the .NET 3.5 Assembles from the Microsoft Website [here]. Basic programming skills are prerequisite. The Nextion Instruction Set is made up of ASCII text based commands inbound, and binary Return Data. A component’s Touch Event “Send Component ID” can be used to defer programming tasks to the user’s MCU. As such, quickly creating an HMI GUI for Nextion does not demand extreme skills – but basic programming skill are expected. When programming logic Nextion side, then users should have a foundation in programming. Note: Installations on other Operating Systems may have been accomplished successfully, but is not officially supported and beyond scope of any manual. The latest version of the Nextion Editor can be downloaded from [here]. There are two versions of the nextion-setup available for download. Compile – builds your project TFT file in the Nextion Editor/bianyi folder. File > Open Build Folder – opens the Nextion Editor/bianyi folder. File > Backup Dir – opens the Nextion Editor/backup folder. File > Import Project will append the imported project into your current project. Currently Imported Project needs to be from version v0.29 and above. Help > Help – launches the Nextion Instruction Set in your web browser. Down Arrow – sets the selected component to .id “highest” of N components. A yellow objname has .vscope local, while a black objname has .vscope global. as well as setting the Project password to password protect the entire Project. Debug will launch the currently loaded project in the Debug/Simulator. If no project is currently loaded you can select a *.tft file to load. About > About Nextion Editor – will show the Nextion Editor version. About > Check for New Version – will check if a new version exists. Tools > Font Generator – opens the Nextion Editor ZI Font Generator. Style – allows you to select between a Blue or Black Editor theme. Be mindful when Exporting a highlighted picture. A *.jpg is lossy. Imported pictures are converted into 565 16 bit color format. Picture Resource Size is calculated: Width x Height x 2 bytes. Almost always, at least one *.zi font resource must be included in a project. Use the Tool > Font Generator to create a font, or an external font tool. Note the font’s size (width = 1/2 height, height % 8 = 0) is fixed width. The page index number can be used for the p[index] array. import a *.page file into your project. Maximum 250 components can be placed on a page. Maximum of 6 timers per page – note scrolling text uses 1. Hotspot is a canvas component, but is not visually seen. Up to 4 waveforms can be on a page. Overlapping components (layering) can be complicated when not seen. At design time, the lowest .id is the bottom layer, highest .id the top layer. Layering will produce component overlap warnings at compile time. Left click to select a canvas component to avoid accidental movement. Only 6 timers are allowed per page – scrolling text components use 1 each. Attributes pane has a dropdown list of components on the current page. Touch Press and Touch Release events have Send Component ID. The Instructions Tab will load Nextion Instruction Set (internal browser). Help > Help – launches the Nextion Instruction Set (external browser). Errors listed in red – will not compile. Do not upload a zero byte file. File Size must be small enough to fit in your Model’s Flash size. Stats for Global Memory usage are listed for the entire Project at top. Use the Device toolbar to change these settings if needed. This is a simulation – this is not an emulation. Users may write to any address, but must care for data until boundary. Upload, Synchronize RTC time and Reboot device. Simulator only, Nextion device only, or both. Toggle hex mode to ensure byte precision in input. Keyboard input is the default simulator input method. Only Nextion or user MCU can be connected, not both. 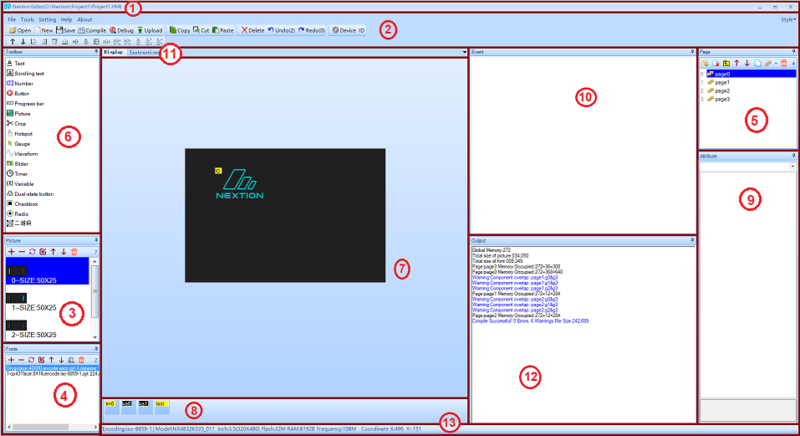 When Nextion is connected to Simulator, portions of connect string is shown here. Sinewave or random waveform input at selected intervals. 0 – Nextion normal mode, 256 to 2815 in address mode. Address will only apply to specialized advanced applications.